November 30 saw the largest Illumination project in recent Franklin history. 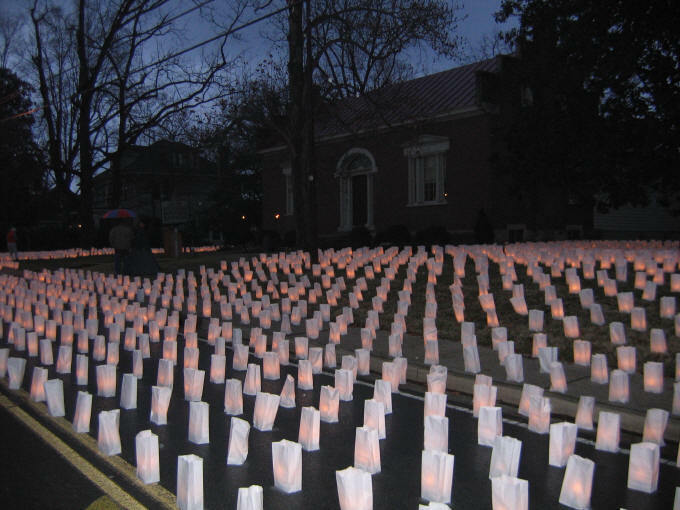 The 10,000 luminaries were a commemoration of the roughly 10,000 American casualties at Franklin. Each luminary represented an American soldier killed, wounded, captured, or missing during the battle. Three-fourths of the battle casualties were Confederate, the remainder Federal. Most of those casualties occurred in the first three hours of the battle. Also represented by each luminary was a family back home devastated with concern and grief when they learned the news from Franklin. The November 30 Illuminations of 2006 & 2007 were very impressive to see, we all agree. But they fell slightly short of the full 10,000 luminaries due to various production difficulties. The 2008 Illumination was set up by 2:22 PM and completely lighted by 3:00PM thanks to a small army of hardworking volunteers. 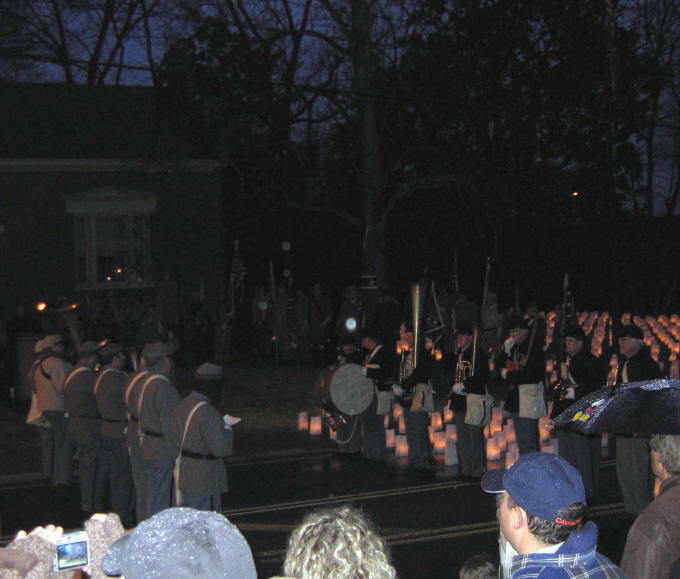 The luminaries surrounded the Carter House and filled Columbia Avenue from Fowlkes Street to Granbury Street. The display provided a vivid visual statement that underscored the human cost at the Battle of Franklin. The Carter House organized an all Confederate march from Winstead Hill to the Carter House stepping off at 4 PM. The Old Towne Brass Band from Huntsville was on hand to provide authentic music during the short ceremony at the Carter House. Half of the band, dressed as Confederates, led the marchers to the ceremony. 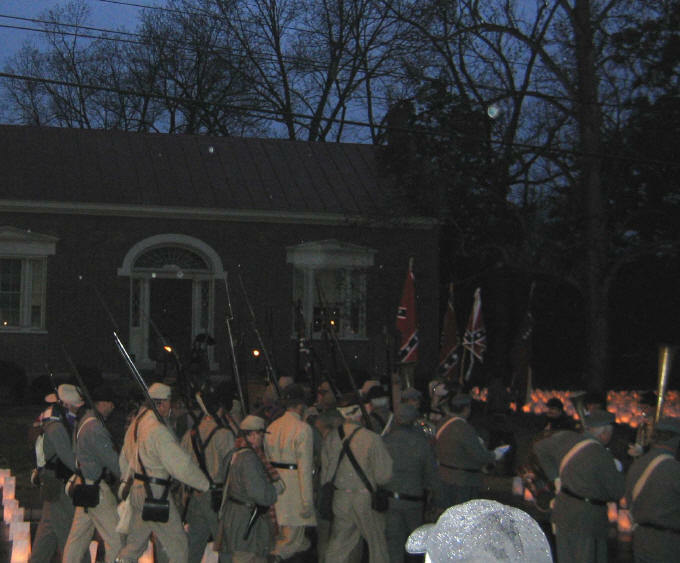 The remainder of the band, dressed as Federals, approached the Carter House from the north. With their authentic instruments and music arrangements, the bands in turn played tunes of the North and South. Franklin Mayor John Schroer commented briefly on the importance of Franklin’s Civil War history and Eric Jacobson delivered a short telling of the battle events and a Memorial tribute. The two bands then joined as one to play music of reconciliation and our national anthem. If you missed the Illumination this year, be sure to join us for 2009. It is a moving experience you will not forget.